It is no secret that we love paranormal books around the blog. A couple of years ago we read Vampire Academy and fell in love with the series. I was so upset when they ended, but my husband was probably happy. I literally had done nothing but read for a week straight. I was ridiculous and didn’t cook, clean or do anything. I was obsessed with those books! 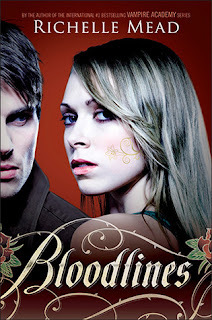 I knew that Bloodlines was a spin off series but I have been so busy with life and other book commitments that I could not take the time to read them. Until now! This year, we have decided to be very selective about the books we read and review. We wish that we could read all the time, but the fact of the matter is that we both work 40+ hours a week and have kids. We have worked so hard on our blog and want to keep doing it, but we don’t want the deadlines that come with so many blog tours. So, this has opened the time for me to be able to read the Bloodlines series-FINALLY! You will remember many characters in Bloodlines from VA; Sydney Sage the Alchemist, Adrian Ishkavov and Jill the Moroi, and Eddie Castille the Dhampir. Of course we see glimpses of Rose, Dimitri and others as well, which is nice. Bloodlines begins with Sydney going on assignment in Palm Springs to help protect Jill from a group of people trying to kill her to keep Lissa from the throne. Eddie, Jill and Sydney are going undercover as siblings and students at a boarding school. Adrian is staying nearby with another Moroi, Clarence and his son Lee is back and forth to LA for classes. This is also where Jill has her feedings. The other Alchemist, Keith Darnell, is posted in Palm Springs. To say he and Sydney don’t like each other is an understatement. He does not want Syd around and will do whatever it takes to keep reminding superiors of her actions in VA when she helped Rose. I love the way Richelle Mead can weave a complex storyline. Things start happening at school and around Palm Springs that cause Sydney to become suspicious. Will she risk being sent for re-training by the Alchemists by working with vampires and dhampirs again? Be sure and one click Bloodlines today and fall in love with the paranormal world she creates all over again!